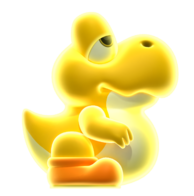 A Glowing Baby Yoshi, also known as Bulb Baby Yoshi, is a yellow-colored Baby Yoshi appearing in New Super Mario Bros. U. It has the ability to light up dark areas by pressing the button on the or by shaking the . The amount of light shone increases the more the player shakes. Glowing Baby Yoshis also have the ability to stun enemies with the bright light. When they are carried they add a chorus to the current music, and they are also capable of eating Boos alongside other enemies. Glowing Baby Yoshi is very similar to a Light Block from New Super Mario Bros. Wii, as both illuminate dark places when carried. Additionally, Baby Bulb Yoshis' overall appearance resemble Bulb Yoshi, from Super Mario Galaxy 2. This is the only Baby Yoshi that cannot be found on the World Map, and therefore, cannot be taken into other levels. In addition, its light-based abilities are only functional in dark areas. However, if the players carry one to the goal, the Glowing Baby Yoshi gives an extra life and remains behind in the fortress, unlike the other Baby Yoshis that remain in front of the building and then follow the characters when they enter. The Glowing Baby Yoshi is only found in levels Fire Snake Cavern and Which-Way Labyrinth. The only other appearance it makes is in the credits scene dancing with the other Baby Yoshis and the power-up Toad House, where they either hold a Toad icon or a Bowser icon. This page was last edited on March 27, 2019, at 20:45.